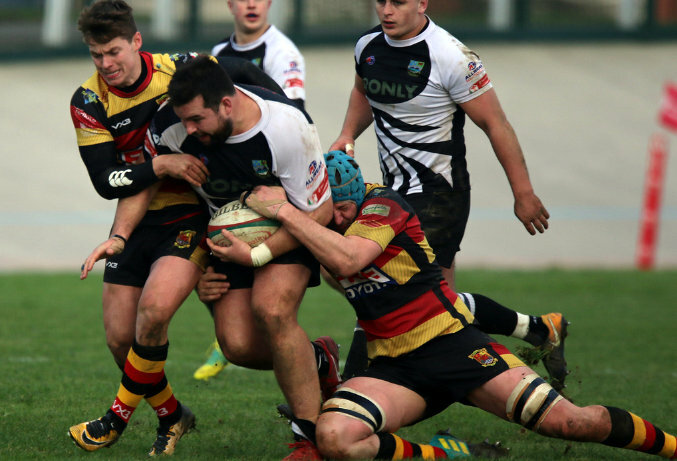 On a weekend when snow and frost led to the cancellation of every other game in the Principality Premiership Brynley Toms and his Bedwas teammates travelled to Carmarthen Quins looking to build some momentum from recent performances. This was a game Bedwas could and should have taken something from but all too often chances to score were squandered due to errors and loss of possession with the try line in sight as they would fall 27 – 13. The Quins were first on the scoreboard after 7 minutes from the boot of full back Aled Thomas after Bedwas were penalized. Bedwas responded well and four minutes later Jordan Rees plucked an errant Carmarthen pass from the air to race through from forty meters to cross for a Try, Evan Lloyd Converted to increase the lead. Bedwas’ attempts to increase the lead come to nothing and the hosts began to put pressure on the Bedwas line. Thomas added a second Penalty for the Quins on 20 minutes after Bedwas were adjudged to be ‘killing the ball’, Craig Hudd being the man deemed culpable and given 10 minutes in the sin bin to reflect on his actions. His teammates dug deep in his absence and no further scores were until the 33rd minute. A catch and drive move from Carmarthen lead to a Try for lock forward Shaun Jones, again Thomas was successful in adding the conversion. With the advantage of the sloping pitch Bedwas started off the second half with vigor forcing Carmarthen into yielding penalties. Lloyd missed a shot at goal on 46 minutes, was successful on 50 minutes but missed again on 55 minutes which proved crucial as the Quins were next to score just short of the hour mark when back rower Gethin Davies crossed under the posts. Thomas kept up his 100% kicking record with the straight forward conversion. Bedwas responded but could not conjure up scoring chances and even when the Quins were reduced to 14 men after prop Javan Sebastian was sinbinned for repeated transgressions could Bedwas find a way through an organized defense. Bedwas made a raft of changes with 12 minutes left to play as they strove to get back into the game and with two minutes left on the clock it looked as if they had done just that as full back Joseph Scrivens notched a penalty to put Bedwas within 7 points and therefore a losing bonus point. It was not to be however. With the clock ticking down and Bedwas in possession that point should have been secure but possession was lost, Carmarthen passed the ball along the line for outside center to cross for a Try converted by Thomas. The referee blowing for full time straight afterwards.